Fans of strong fat burners would instantly be familiar with the White Lightning name. It had a reputation for being a very strong fat burner, but was taken off the market due to regulatory changes. After a long wait, APS have released a new version of White Lightning in powder form for the Australian market. How does this stack up to the original? Much like its predecessor, the new White Lightning is among the strongest on the market, even with modern legal revisions. The 5 g proprietary blend is packed with stimulants and fat burners including Acacia rigidula, guarana extract, green coffee extract, Theobromoa cocoa extract, green tea extract, grapefruit extract, Citrus aurantium extract, Citrus limonium extract, Coleus forskolii extract, raspberry ketones, higenamine, and black pepper extract. In other words, it has pretty much all the latest and hottest fat support ingredients known to man! Most powdered fat burners have ingredients such as taurine as the first ingredient. However, what makes White Lightning special is that the first ingredient is actually Arcacia rigidula. For those that aren’t in the know, this ingredient is the secret weapon in Mesomorph 2.0 that really gives the pre workout its kick. It should therefore be no surprise that White Lightning would be strong, especially with this much Arcacia. In addition there is also 300 mg caffeine (from guarana and cocoa), theobromine, synepherine from Citrus aurantium, and higenamine, all of which are stimulants. For most people, a single scoop would be enough for a whole day, which means you get a massive 60 days’ worth of product from a single tub. With your first serve of White Lightning, the huge energy rush is hard to miss. However, unlike some other strong fat burners, it is not a shallow product that merely gives you a buzz. Other ingredients such as green coffee, green tea, grapefruit extract, forskholii, raspberry ketones, and black pepper are not stimulants, yet all have research backing to suggest effectiveness for weight loss and fat burning. If you feel that modern fat burners simply do not provide enough energy or kick, White Lightning should a product serious enough to meet your requirements. This high stim product’s strength is also a weakness. Not everyone is after a product with this level of stimulant. If you are stimulant sensitive, we would recommend you try an alternative product. APS also have a reputation of not being particularly transparent with their labelling. All we know is that the product contains around 5 g of actives and 300 mg of caffeine, but its proprietary blend gives little else away. Fans of Mesomorph 2.0 would instantly be familiar with the flavour profile of White Lightning. It mixes relatively well into a shake with a very characteristic aftertaste, just like that found in Mesomorph. Again, like Mesomorph, APS have recommended that almost a full litre of water be used to make up the shake. In our opinion we find this excessive and difficult to consume such a large volume. If you don’t mind a stronger tasting shake, you may like to use around half as much water. 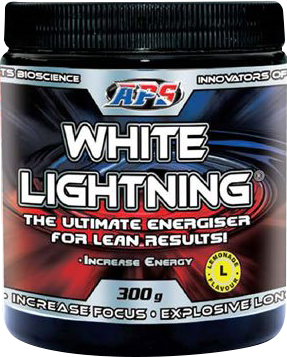 In short, APS White Lightning is definitely a contender for “Strongest Fat Burner” award, if we had one. Fans of the original White Lightning, or strong fat burners, would not be disappointed in this new formula. Despite the stims, White Lightning has enough substance to help with fat burning instead of simply getting you wired. However, if you are stimulant sensitive, look elsewhere!